We'll be seeing Windows 8 Ultrabooks in the second half of this year and Acer will be among the first to produce them. That's according to Acer's CEO J.T. Wang who used his company's CES 2012 press conference to talk up Ultrabooks, predicting they will be mainstream during the next two years. "By Q2 this year we will have four models of Ultrabook [on the market]. More will come when next generation Windows launches in the second half [of 2012] we will launch another wave of Ultrabook product line," said J.T. Wang, who also lamented the poor economic outlook for 2012. The company announced the Acer Aspire S5 today to complement the already-launched Aspire S3. Acer also revealed the Aspire Timeline Ultra, the first Ultrabook-spec machines to feature an optical drive. 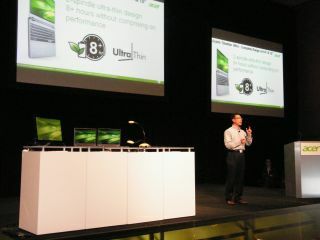 Wang also said that he expected Ultrabooks to form a considerable part of Acer's sales this year. "We estimate this year that 25-35 per cent of Acer [notebook products] will be Ultrabook. In the next two years we will make Ultrabook a mainstream [product] and we will cover all customers and all segments." Wang also said he expects the next generation of Windows to make a difference across all device categories, helped by Windows 8's compatibility with ARM processors. "We see a lot of opportunities can be created…we see a lot of [ways to capitalise on these in the] second half of this year."